I purchased 1000 1-inch crickets via mail order from an animal feed insect farm in the US. The crickets were shipped from a different farm than I ordered from. I’m not sure why. Unfortunately, the package did not meet the live guarantee. There were about 2-3% crickets that were past their prime. I refrigerated the whole package for an hour then sorted the crickets on the patio. Some were lively but I was able to separate the good ones from the bad ones and frass. It was quite an event. 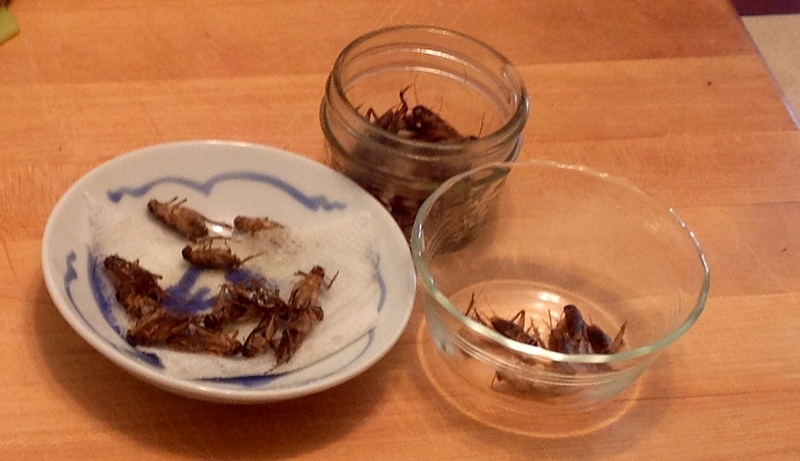 After sorting, the crickets were placed in the freezer until used. 1000 crickets yielded 1 lb. I didn’t measure this but the bulk volume was about 5 cups. It would be a great service if cricket farms offered sorted frozen crickets (like Millennium Farms). Live crickets can easily be separated from the chaff at the farm. The crickets that climb the egg cartoon type ladders are alive and well. They can then be place directly into a freezer. Frozen crickets might be something pet lizards and owners like too. Frozen is more convenient and better tasting than dehydrated. Canned: Crickets were poached in boiling water for 2 minutes, drained, added to glass canning jars. Boiling water was added to cover crickets, a pinch of salt was added. Crickets were processed for 90 minutes at 15 PSI (250 Degrees F) using recommended canning procedures. Poached: Medium intensity flavor impact. Earthy/mushroom-like, brothy, vegetative, sulfury. The texture of the exoskeleton was pliable and slightly chewy. Females had crunch from the eggs. Sauteed: Stronger in flavor. Shrimp/seafood like flavor notes were noticeable. The shell was slightly brittle and broke apart easily with chewing. Canned: Mild in flavor. Earthy, brothy, vegetative flavor notes. The texture was very soft. The difference between males and females was less noticeable. The canning liquid was slightly cloudy and brown in color (similar to beef broth). The canning liquid was brothy/meaty in flavor and had a strong umami impact. Here is what we did with our bounty. The poached crickets were chopped and used in a scallion, mushroom and cricket omelet. Some of the poached crickets are being made into cricket flour. The sauteed crickets were just eaten as is with a little salt. Saute to your liking, I would have preferred them a little more crisp. The canned crickets were used in cricket salad (crickets, celery and mayo) on crackers. All were well liked. This entry was posted in Product Development and tagged Canning, Crickets, Entomophagy, tasting notes on April 24, 2014 by Bob. Hey there, thank you very much for the mention regarding us at Next Millennium Farms, shipping frozen insects. If freshness is what you are after, we can euthanize and ship same day or overnight. We can ship anywhere in the united states! Our crickets are farmed at a dedicated for human use farm. Our sieving methods and standards of farming comply with human food production (like wearing hair nets for example). Our processing facility and processing standards, also comply with health safety standards and both have been government inspected and approved. PS. looks delicious! !